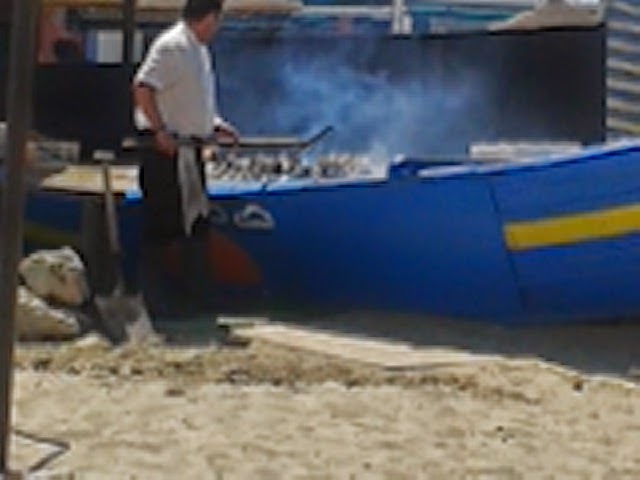 Being a coastal town, the food in Marbella is, as you would expect, mosty seafood. But all types of cuisine can be found, from traditional Spanish tapas and paella to Italian, American and Asian. I adore Spanish food, (as you may have noticed!) and ate as much of it as possible, whilst my outlaws and kids stuck to what they know. My favourite dish on this trip was probably the alitas de pollo, and, as ever, tapas. 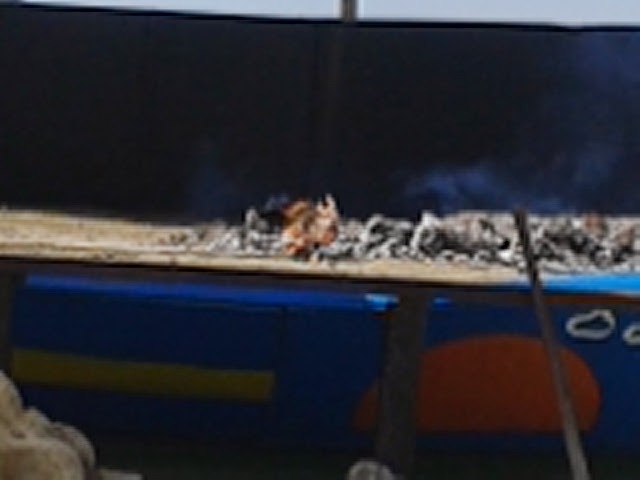 And I learnt a new Spanish word, chiringuito: a small beach bar where they cook the fish right there on the beach - when I go back I will just do chiringuito-crawls all day! Some of the chiringuitos on Marbella beachfront. Wish I'd known about these at the beginning of the week! "This little chiringuito was one of the nearest to our apartment, and we weren't expecting much, as we were so tired from travelling on our first evening. However, we were seated, outside, on the beach, straight away, and the service throughout was friendly and very accomodating. 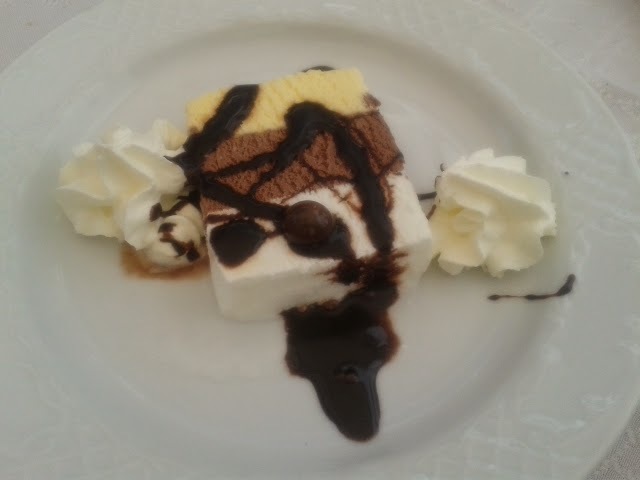 The kids only wanted ice cream, and that was no problem as we adults all ordered main courses. The steaks were massive! The swordfish was cooked and presented very nicely with just enough sides of baby potatoes and vegetables. The dessert menu was a little disappointing, none of it was fresh, it seemed to be all frozen packaged desserts. Absolutely gorgeous location though - not obvious from the promenade!" Buddies Bar, cooking paella outdoors, with lots of tapas on offer. "We just stopped in for a quick drink on the way to the supermarket, but it was so lovely in the garden we stayed for lunch. Although the waiter couldn't speak English (I was glad to be able to practice a little Spanish) he was very able to communicate, and friendly. 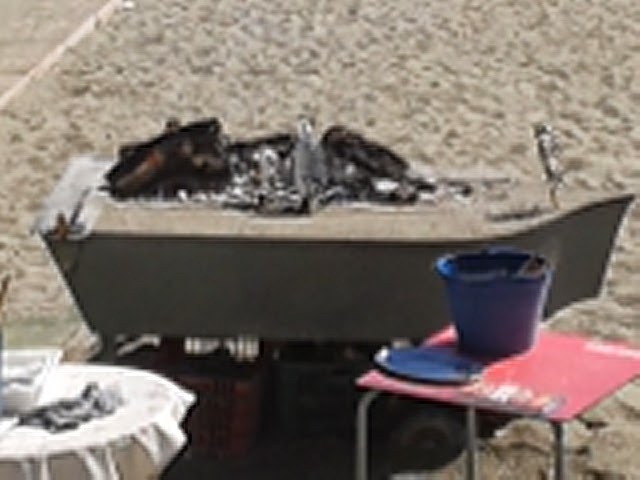 The barbeque smelt delicious and there were several Spanish families enjoyed the tapas and grilled fish. We just had the usual tourist food - burgers, chips and oh, more chips, but it was well cooked and presented nicely. I would recommend for food and afternoon drinks." The starters - garlic focaccia and salmon fishcakes - at Fantasia were excellent, as was the calzone, and the service was great. "We really enjoyed our meal at Fantasia. Although it wasn't near the beach or the sea, and we were the first to arrive, by the end of the evening, there was a buzzing atmosphere and there seemed to be a lot of locals and regulars, always a good sign. The service was exceptional, friendly and polite, and we were made to feel most welcome, with young children, even though they don't cater for children - although the playground across the road was a good distraction! 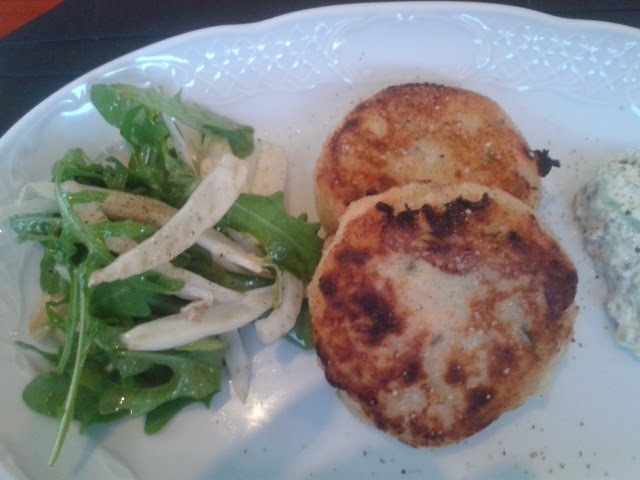 The kids were happy to share a pizza, and the fishcake starters were delicious. 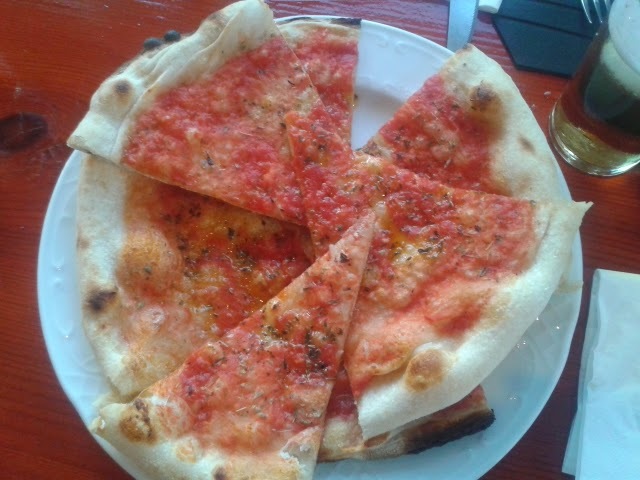 All the pizzas were cooked well and tasted great, I would even say they were too big! It was worth the price, as it felt like we were dining more formally, and in true Italian style. Definitely recommend." La Creperie served only crépes, but don't worry, beer too! "It was right about lunch time when we stopped for a pre-lunch snack, and La Creperie served a huge variety of crepes filled with savoury and sweet. 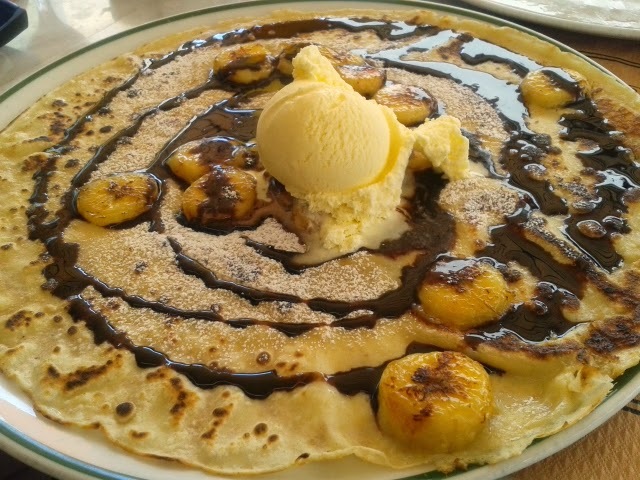 We ordered sweet crepes, con nutella y platano y helado, and it was served in a friendly and polite manner. Well cooked and beautifully presented. 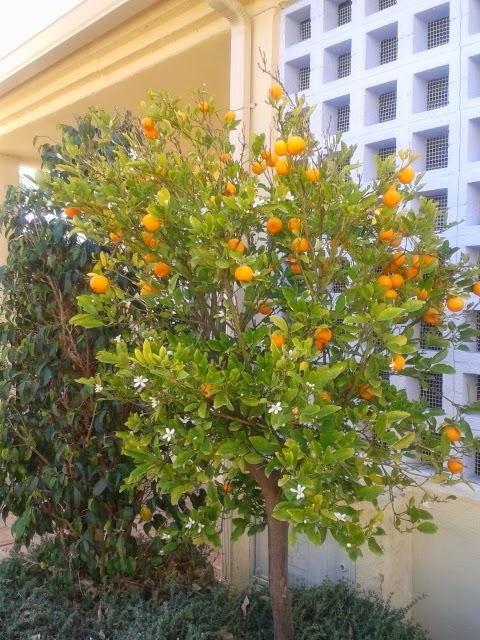 Quite pricey for what it is, but as you eat you can people-watch, and gaze into the windows of Hermes and Dior, whilst Hummers and Lamborghinis cruise past..."
Orange trees outside our apartment. One very disappointing lunch was at Alabardero. "In the middle of our holiday, we were attracted to this restaurant by the bouncy castle in the garden - lunch and a few cool drinks while the kids entertained themselves - not so. We waited at least 10 minutes before being greeted, and even then, I had to ask for a table. The waitress asked us how many, and did we have a reservation, then went back to serving paella and completely ignored us for another 5-10 minutes. The manager finally greeted and seated us, he was quite jolly and friendly, to be fair, but we had to waaaait for our order to be taken. Then waaaaait for our drinks to arrive. At each point a different waiter served us, so asking one for fresh napkins, resulted in him never been seen again. The drinks waiter spilled apple juice all over my mother-in-law. A different waiter took our food order (eventually) and when asked if they had a kid's menu, just grunted 'no'. How could we be so silly? Then he seemed to realise how rude he was being, and informed us that the dishes with stars were suitable for children. The food arrived after several years, though not all together, so some of us were eating, whilst others were kept waiting. 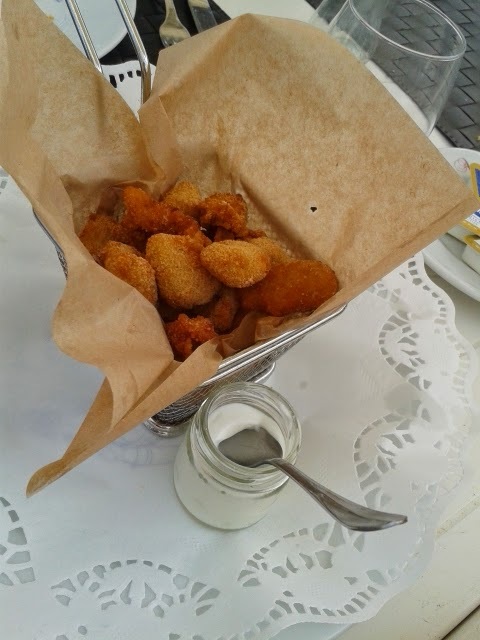 None of the food came with anything on the side, so the prices were ridiculous, £10 for a small basket of Palomitas de pollo - chicken 'nuggets'. My son had scoffed them all before the ketchup he asked for arrived. The only remotely good thing about this restaurant was the paella, which was flavoursome but even so, slightly undercooked. Absolutely dreadful service. Rude, hurried (they weren't that busy, the lunch rush was clearly over) and unfriendly. Then surprised exclamations when we said, no, actually everything was not alright... AVOID!" Sangria de Cava, Tapas and kids' free dessert at Casa Eladio. "After wandering round Plaza de los Naranjas, and avoiding one chap trying to persuade us to eat indoors on a beautifully sunny lunchtime, we discovered this little gem. 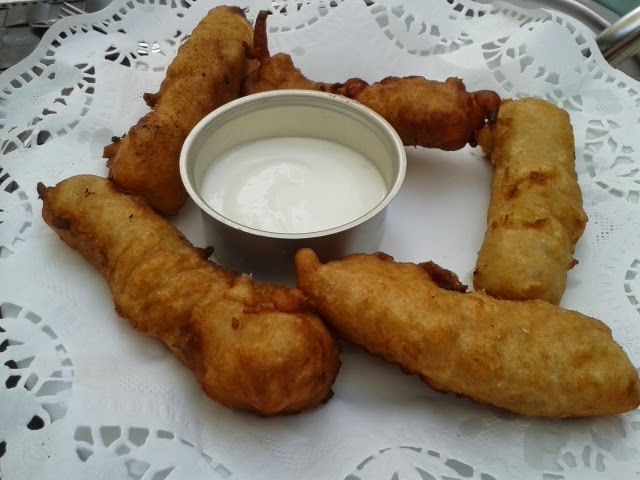 They offer a lunchtime selection of 4 tapas for only 7 Eur, and 6 tapas for only 9 Eur! I was able to order practically everything on the menu! 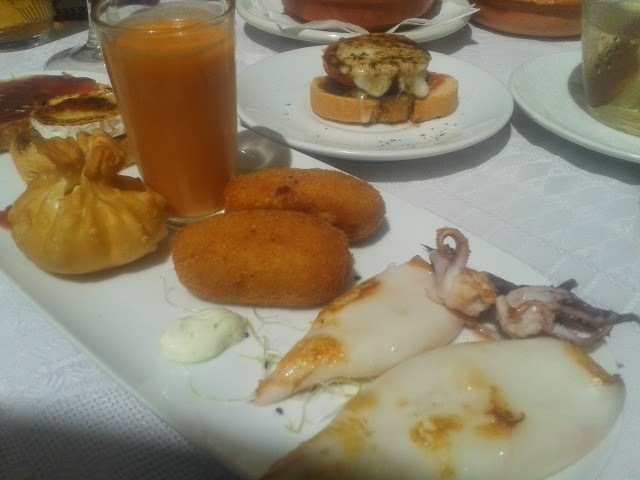 It was all good - I'm not a big fan of squid, but the little tentacles were crunchy and salty, and the Iberico croquettes were deliciously salty. The goat's cheese puffs were creamy and just the right texture. 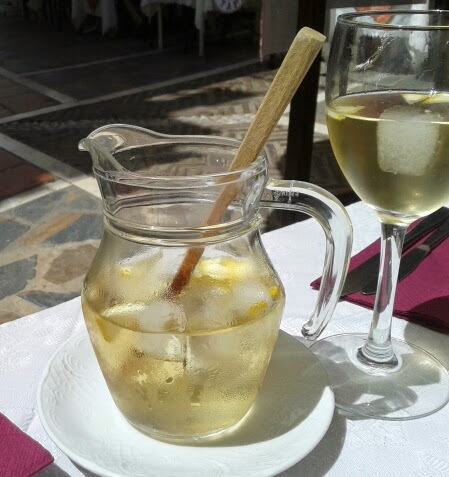 Washed down with some Sangria de Cava, I think this was one of my favourite restaurants in Marbella town. Even got the oldies finally to try out tapas!" 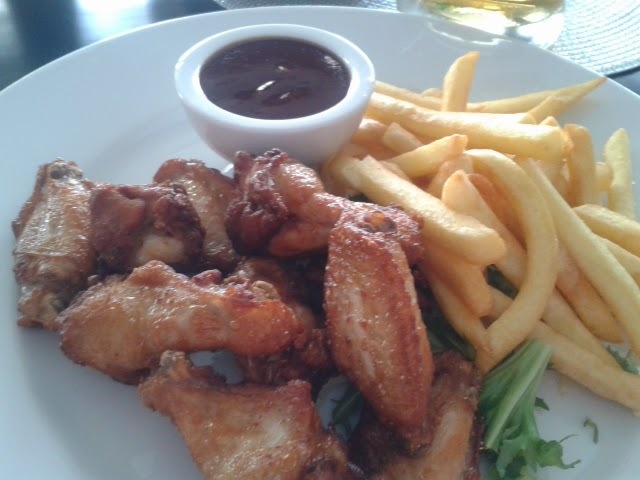 Lunch at Piucaro, overlooking the sea at Puerto Banús... Alitas de pollo - so good the kids scoffed most of mine! "Located directly overlooking the sea, along the front promenade before you reach the Puerto Banús marina itself, this was a lunchtime find. It felt a little formal to begin with, but once we had a nice cool beer it was very relaxing and suitable for people-watching. A good range of touristy and local dishes, my alitas de pollo (chicken wings) were particularly good - enjoyed by the kids too. The battered fish was well recommended for the batter, and the hamburgers on flatbread were well cooked and nicely presented. Slightly on the pricey side, but for the location, very good value. And friendly, helpful service too." La Pesquera, at the far end of the promenade, towards Estepona, good for breakfast, but get there before noon! "On our first morning, pre-supermarket trip, all we wanted was a spot of breakfast. Being completely unfamiliar with the area, we wandered FOREVER along the promenade towards Estepona, passing all manner of beach bar, none of which were open til 12 noon. 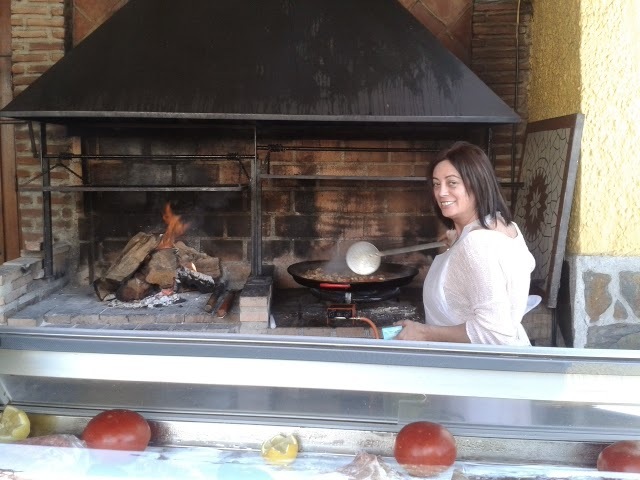 Finally we came to Estepona market (Sundays) and this restaurant, which was serving breakfast, only til noon - we were just in the nick of time! 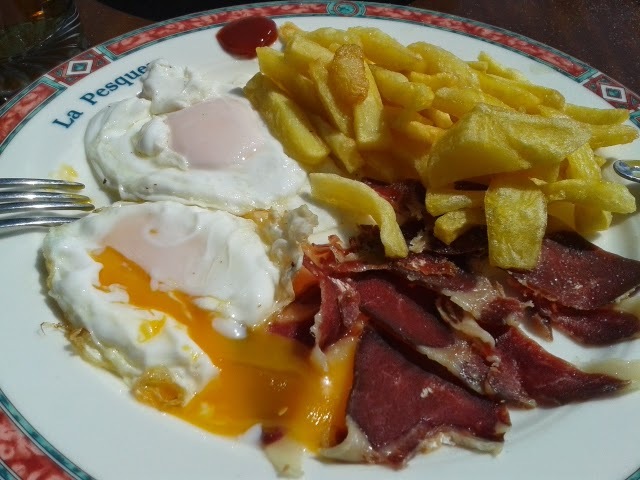 We all ordered Iberico janon and huevos, with chips - well it was practically lunchtime. Good coffees too. Perhaps we were exceptionally ravenous, but it all tasted great. The lunch and dinner menus looked appetizing - it was mainly fish, as you would expect. A lovely place for a long sunny day to sit and watch the sea..."
All reviews from TripAdvisor written by me.